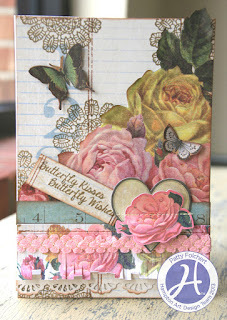 Hampton Art Blog: Butterfly card inspiration! It is Gloria with you today. 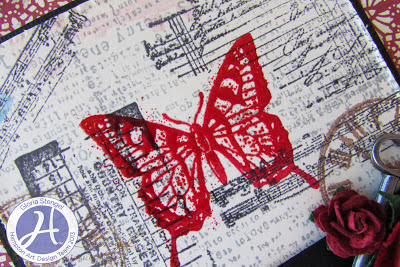 I have a collage card, where I have made the butterfly focal point image "pop" of the page by using embossing powder. 1. Make a black, top fold card 5 x 5 inches. 2. Trim designer paper 4 7/8 x 4 7/8 inches distress edges. 3. Wrap black satin ribbon around the designer paper and secure to the back. Attach the panel to the card front. 4. Trim black cardstock to 4 x 4 inches and attach to the center of the card, slipping the black cardstock under the ribbon. 5. Trim cream cardstock to 3 7/8 x 3 7/8 inches and stamp a variety of images in several ink colors. Cover the panel by stamping the images multiple times. Allow to dry. Distress paper edges. 6. 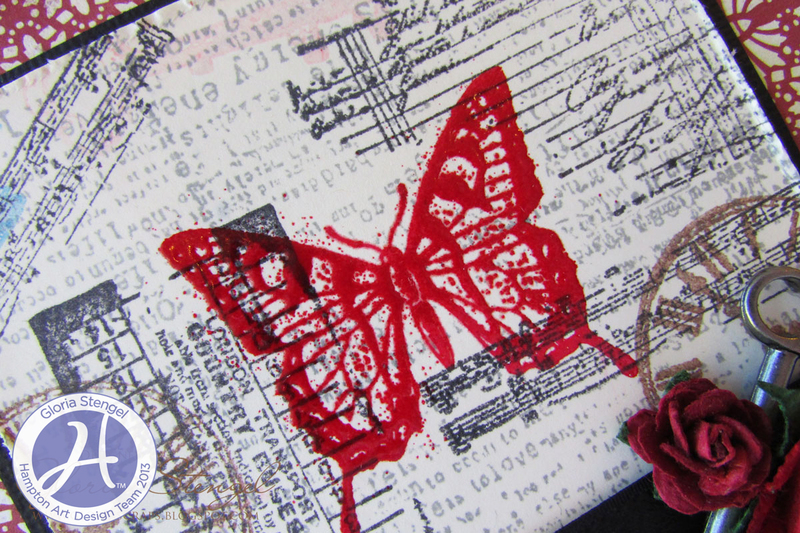 In the center of the cream cardstock, stamp the butterfly image with Cranberry pigment ink. Emboss with red embossing powder. Attach the cream panel to the black center panel on the card front. Make sure to slide it under the ribbon as shown. 7. Using a strong, white glue, attach a metal key and several paper flowers to the right side of the ribbon as shown. 8. Add cream cardstock to the inside of the card. May wishes to you, Patty here with vintage look card for my Mother created with KI Memories papers and 2 different Hampton Art stamp sets. My mother loves the old fashioned look so I took advantage of the new KI Memories Vintage Charm collection. I began building this card on top of the “Blue Ledger” paper, which I stamped with the doily stamp in brown from the Hampton Art/Echo Park-Oh Snap stamp set. Then I fussy cut out the roses from “Roses” paper. I then added a ruler border strip from the “Rulers” paper. Then I utilized the fun “So Very Sweet” ruffle sticker. To add some more texture I chose the ruffle sticker strip of “Roses” with the fringe edge. To complete my theme I then fussy cut two butterflies from the paper “Butterflies”. The Jillibean Soup –Chilled Cucumber Large Stamp set offered the perfect sentiment for my card, “Butterfly Kisses, Butterfly Wishes. ;” Which I stamped onto the “Blue Ledger” paper and popped up with foam dots. Then I just added a punched border strip and some pink vintage trim to finish the card off. Two cards by Laurel Seabrook! Cards with a lot of Love! She Left Beauty card by Gini! 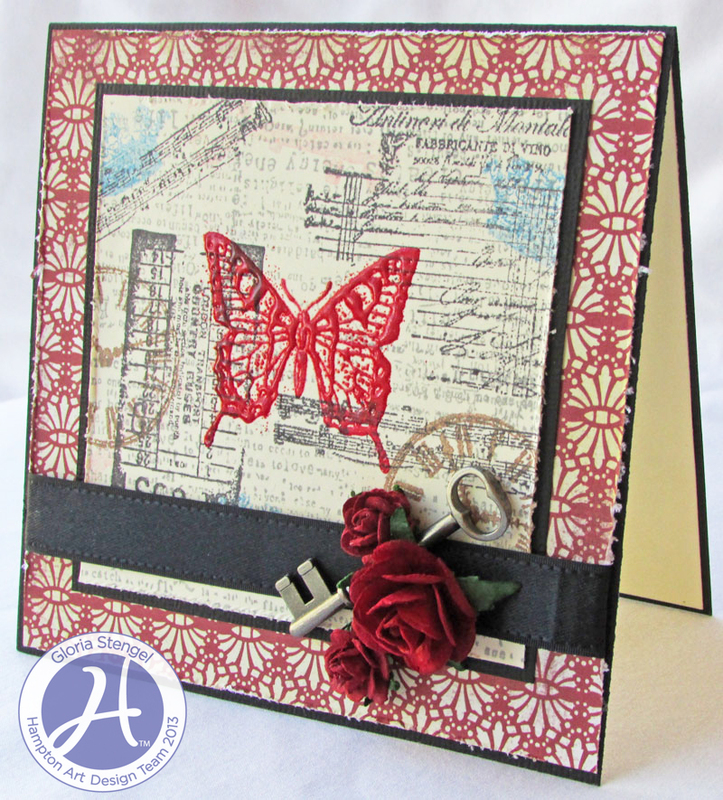 More cards using Bella Blvd licensed stamps! 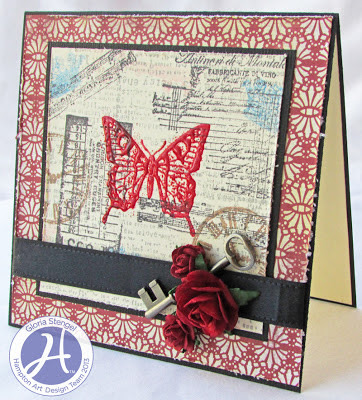 Mixing Kraft paper and stamps! Masculine cards in time for Father's Day! Hi, Hello, Thinking of you cards! Wall Hangers - Fabulous Gifts!